Explore the depth of your images by visualizing and interacting with them in three dimensions. Image-Pro Plus 3D includes all of the features found in Image-Pro Plus with additional tools for three dimensional rendering and measurements. These 3D tools are also available in Image-Pro Analyzer 3D, an analysis-only version which combines Image-Pro Analyzer with 3D rendering and visualization. 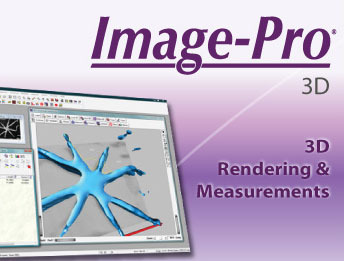 Ask us if Image-Pro Plus 3D is right for your application! 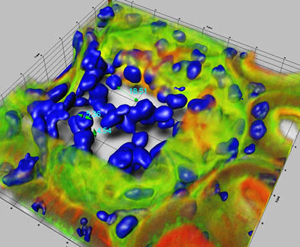 Obtain quantifiable data from your three-dimensional image through manual and volume measurements. Industrial image created with Image-Pro Plus 3D Suite. Dendritic spine tracing of 3D neuron. 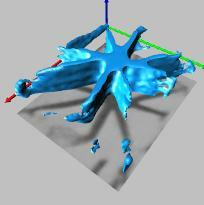 Image courtesy of Ling Wang and Brendan Brinkman, University of California, San Diego, CA, USA. Track and measure the movement of individual objects in a 4D sequence with the 4D tracking feature in 3D Constructor. Choose to automatically find 4D tracks in your image or manually track objects. Analyze neurons and other filament structures with the neuron tracing tool in 3D Constructor. Visualize and count the number of branches in a neuron as well as the length and volume of each branch. Use Image-Pro’s colocalization tool to indicate which fluorescent regions are to be considered as overlapped, or colocalized. Then activate 3D Constructor to display the colocalized regions in three dimensions. Share your 3D rendered images with others using 3D Constructor’s easy 3D animation creation tools. Create animations with changing transparencies, slide positions, colors, etc. to give others a better understanding of the depth of your 3D image. Save in AVI or multi-frame TIFF or SEQ formats. Display and interact with measurement data from individual, histogram, or scatterplot displays. Export 3D measurement data to Microsoft® Excel. are new to Image-Pro Plus 3D or you are an experienced imaging professional, our courses are designed to help you make optimum use of the latest imaging software techniques. When you register your copy of Image-Pro Plus 3D, you are entitled to 90 days of support through our Technical Support Program. Receive installation and configuration troubleshooting from our Technical Support Engineers via phone or email. Extend your technical support beyond 90 days to receive expert support year-round. Read Support: TIFF, IPW, JPEG, JPEG 2000, EXIF JPEG, Flat (binary), GEL, TGA, BMP, PhotoCD, HDF, QED, FITS, AVI, and SEQ files. Stack & Confocal Read Support: SEQ (Image-Pro and StreamPix), STK (MetaMorph), PIC (Bio-Rad Confocal), LSM (Zeiss Confocal), DEB and AVZ (AutoQuant Stack), LEI and LIF (Leica), DM3 (Gatan), DV (DeltaVision), and Fluoview 1000 files. Write Support: TIFF, IPW, JPEG, JPEG 2000, Flat, TGA, BMP, EPS, AVI and SEQ files. Support for 24-, 36-, and 48-bit color; 8-, 12-, and 16-bit grayscale as well as 32-bit floating point images. Ask us if Image Pro Plus 3D is right for your application!